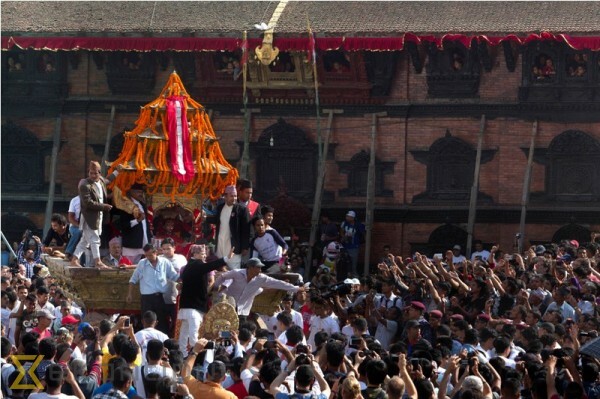 Indra Jatra begins every year from the day of the Bhadra Dwadasi to Ashwin Krishna Chaturdasi. It is a eight day long festival. Indra’s mother needed parijat, a type of flower, for some religious ritual so Indra disguised as a human being came to the earth to fetch them. But, he was recognized when he was to steal the flowers so the people caught him and tied him with ropes. The statue of which is still worshipped in Maru Tole in Kathmandu. 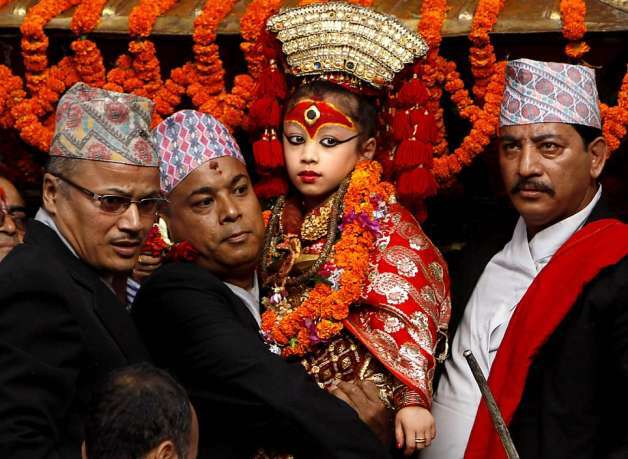 This image is also put on display with others in different parts of the city during Indra Jatra festival. Indra Jatra is a very interesting festival because for the whole week people enjoy various traditional dances and witness the chariot of Goddess Kumari, Lord Ganesh and Lord Bhairav being pulled through the older parts of the Kathmandu city. A day has been added to the original seven days of celebration and on that day known as Nanicha yaa the chariots are pulled through Naradevi, Nhyokha, Ason, Indrachwok and Hanuman Dhoka. This extra day of chariot pulling was introduced by King Jaya Prakash Malla in 1765 B.S. In Indra Chowk, the famous Akash Bhairava bust is displayed and it is decorated with flowers. This Akash Bhairava’s head is related to the Mahabharata story. Some believe it to be the head of the first Kirat King Yalamber. In Indra Chowk, every night different groups gather and sing bhajans and hymns. During Indra Jatra, there are a variety of performances including the dances of Sawa Bhakku Bhairav from Halchowk, Majipa Lakhey from Majipat, Devi Nach and Yeravat hathi (Pulukisi) from Naradevi, Mahakali and Kathi Maka Nach from Bhaktapur. 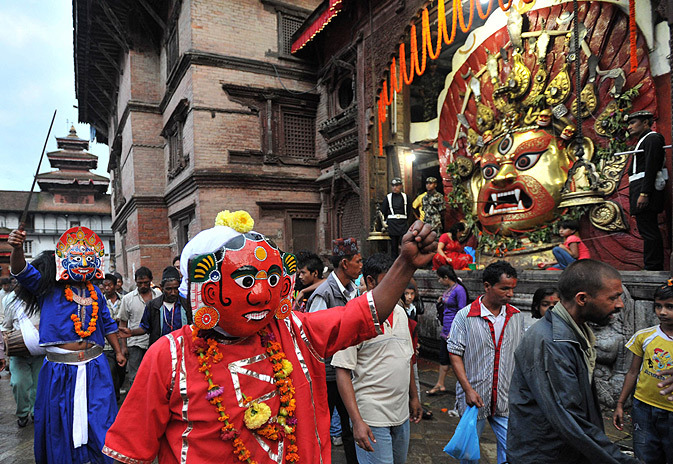 All the dances take place around Hanuman Dhoka area. The Dasavatar or the ten incarnations of Lord Vishnu is also staged every night. The first day of the festival is also observed by the Newars as a day to remember the family members who died during the past year by offering small oil lamps along a traditional route covering all the parts of the old city. It is believed to have been started during the reign of Mahendra Malla. The Linga (Yasingh) is pulled down signalling the end of Indra Jatra festival. It is taken to the confluence of Bagmati and Bishnumati in Teku to be put to rest.